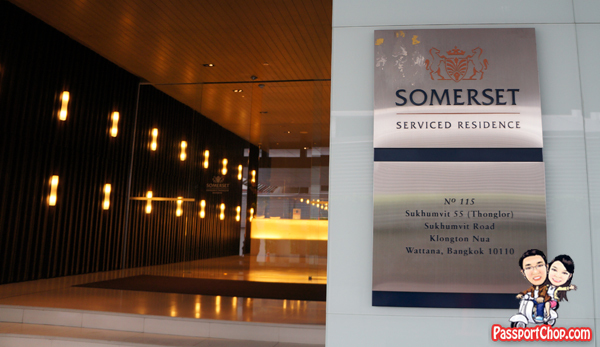 Located in Soi Thonglor, one of Bangkok’s most popular expatriate districts, Somerset Sukhumvit Thonglor is close to the financial and business districts with entertainment, nightlife, shopping and restaurants nearby. 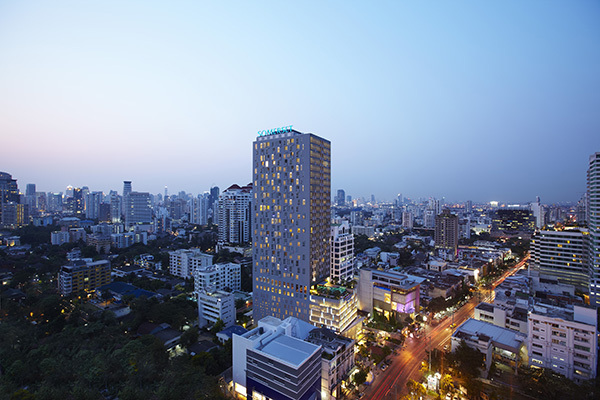 During our recent trip to Bangkok, PassportChop had the opportunity to check out 2 Ascott properties – Citadines Sukhumvit 11 Bangkok and Somerset Sukhumvit Thonglor. Read on for our reviews of Somerset Sukhumvit Thonglor Studio Deluxe Room and its facilities & amenities. Somerset Sukhumvit Thonglor Serviced Residence’s value proposition is very different from Citadines Sukhumvit 11 Bangkok and they target different groups of travellers. We noticed that there are a lot of Japanese expatriates staying in Somerset Sukhumvit Thonglor as well as their families. If you are looking for nightlife as one of your criteria for choosing a hotel in Bangkok, I suggest Citadines Sukhumvit 11 with the happening Mulligans’ Pub just downstairs and rows of Volkswagen van-bars just across the road. The atmosphere here at Somerset is more family-friendly and quiet – there are of course nightspots around the area but you would like to take a taxi there – generally the area around here throughout the day is quite quiet. Each of the 262 spacious studios, one and two-bedroom layout features separate living and dining areas, wireless internet access, a fully-equipped kitchen, home entertainment system, modern amenities and designer fittings. The stylish contemporary décor adds to the comfortable residential atmosphere desirable while living and working in the vibrant city of Bangkok. 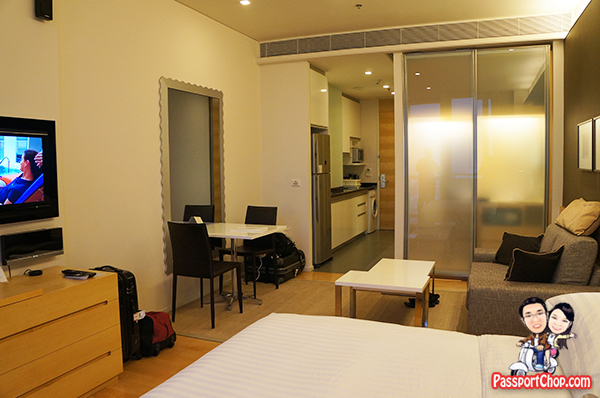 Our Studio Deluxe room is the smallest category (40sqm) of rooms in Somerset Sukhumvit Thonglor but the size is almost that of a junior suite in major hotels in Bangkok and the room amenities are comparable to any of these hotels. 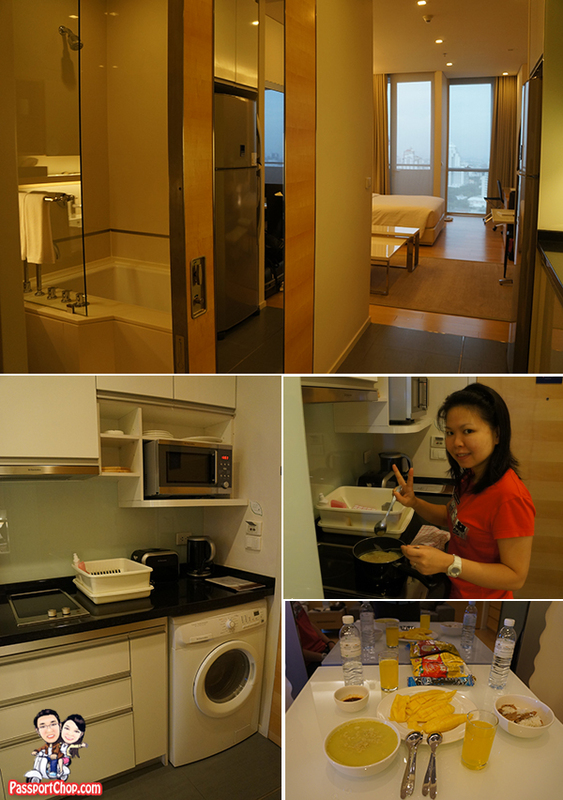 The bathroom is equipped with a jacuzzi-bathtub and toiletries. The fully-equipped kitchen is also very impressive with Cooker hob & hood, Electric kettle, Glassware, crockery, cutlery & utensils, Microwave oven, Refrigerator, Toaster and even a Rice cooker (upon request). We were able to prepare a delicious meal direct from the kitchen when we were too tired on our last day in Bangkok to go out – we just grabbed some groceries from the supermarket right across the road from Somerset Sukhumvit Thonglor. If you are travelling in a family and want lots of space in your hotel, Somerset Sukhumvit Thonglor is a great accommodation of choice. While not located in the Pratunam shopping area, the taxi fare from Pratunam to Somerset Sukhumvit Thonglor will cost just about 6-7 Singapore dollars (metered fare) and will take about 10 minutes (without traffic jams). 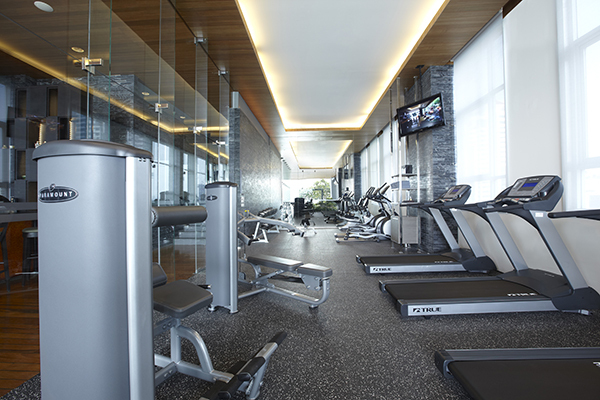 Start the day with an invigorating workout in Somerset Sukhumvit Thonglor’s well-equipped gymnasium – free weights, treadmills, weight machines, you name it- they will likely have it. After which, you can wash up at the shower room near the gym or sweat it all out with the in-house sauna. Towels are provided and there are also lockers for your valuables. 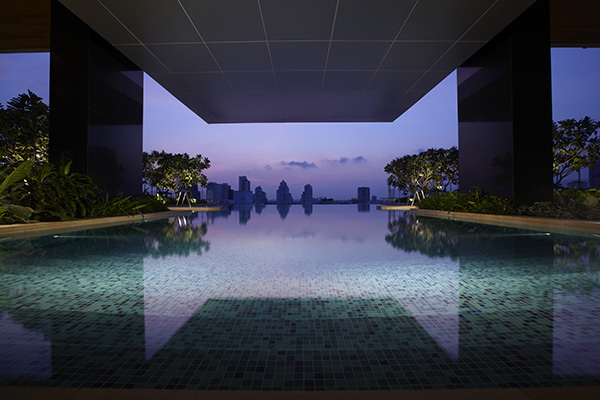 Take a dip in Somerset Sukhumvit Thonglor’s infinity pool and enjoy the beautiful skyline views of Bangkok. After which, enjoy a soak in the Jacuzzi just by the swimming pool. Enough exercise for the morning, tuck into a hearty breakfast with some bacon and sausages and omelettes (upon request) at the Pool at 9 Restaurant and Tapas which is located by the crystal-clear poolside with an outdoor bar overlooking Bangkok’s panorama city view. 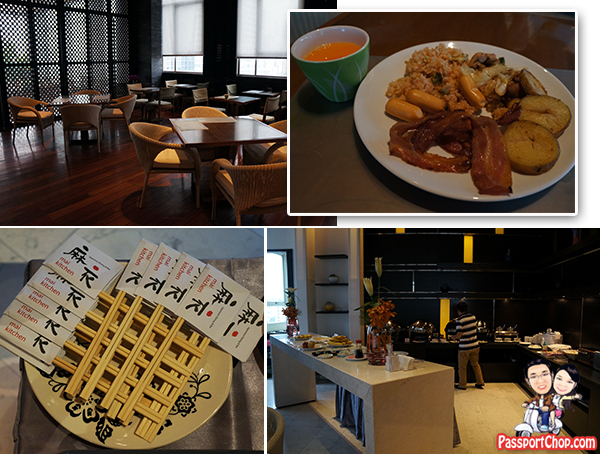 The best thing is that the restaurant, gymnasium and swimming pool are all located on the same floor so just bring your stuff down to Level 9, lock your valuables in the lockers and enjoy the morning with the above activities. 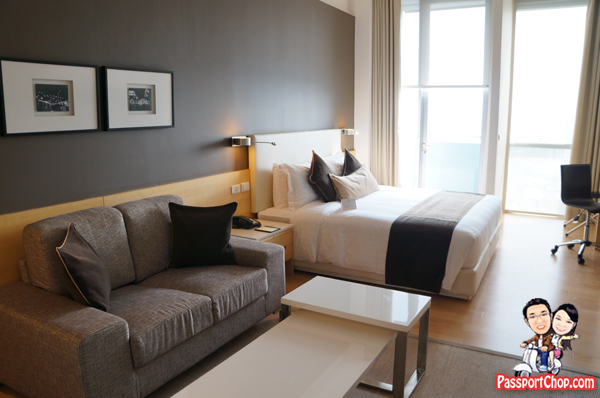 Chill out in your comfortable apartment after breakfast, catching up on movies at HBO or news at CNN/BBC. For lunch, you can consider preparing a simple dish at your room’s kitchenette – groceries are available at the supermarket just opposite Somerset Sukhumvit Thonglor. If you plan to go for shopping at Pratunam, you can catch the train from Thonglor Skytrain station. The BTS Thonglor Skytrain station is minutes from the residence with Somerset Sukhumvit Thonglor complimentary tuk-tuk service. 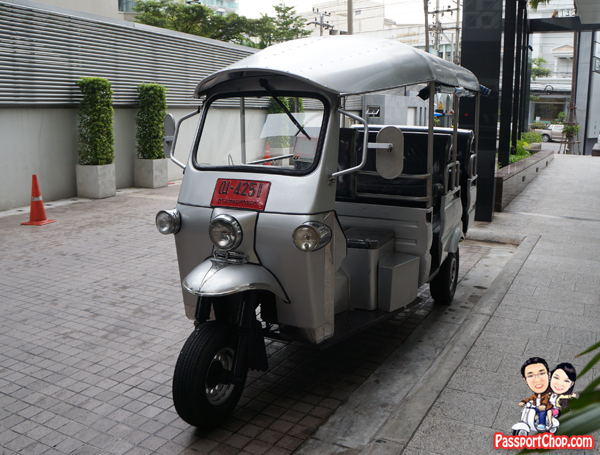 The tuk-tuk is clean and spacious just like the one at Sukhumvit Citadines 11 and it will stop at Thonglor Skytrain station. The tuk-tuk might also provide drop-off service at other nearby attractions such as J-Avenue and Villa Market (enquire at the front desk for more info). For dinner, enjoy the traditional Thai dishes at Baan Ice Restaurant (located conveniently within the Somerset Sukhumvit Thonglor area) served in a comfort setting suitable for families and friends. Somerset Sukhumvit Thonglor organises regular residents’ programmes – usually to celebrate an event or holiday so check out the noticeboard by the lift for more information and sign up if you are interested. Ascott has developed an Around our Residences Facebook app that provides travellers with local insights to help them navigate the city during their stay at any of Ascott’s serviced residences. The application is a mash-up of Facebook and Google Maps, enabling users to share useful tips and get an inside peek to some of the unique finds one can discover within the vicinity of an Ascott serviced residence. There are recommendations from Residence Managers at Ascott, Citadines and Somerset properties and other Facebook fans on topics such as which supermarket to find the freshest produce or the nearest local bank. Travellers can tap into app to discover interesting local haunts, the coolest shops or the hippest bars. By Taxi: 45 minutes drive and costs around 400 Baht.